Butterfinger Candy bars are one of my favorite candies ever, so I really wanted to make a copycat version, because I’m like that. Most homemade versions are chewy rather than crunchy, though. For my homemadeButterfinger recipe, I wanted to make sure the results were crunchy and crispy rather than soft and chewy. If I want chewy, I’ll eat fudge, am I right? Anyway, settle in friends, and I’ll show you exactly how to make this Butterfinger candy! 4.1 Are Butterfinger Bars Gluten Free? 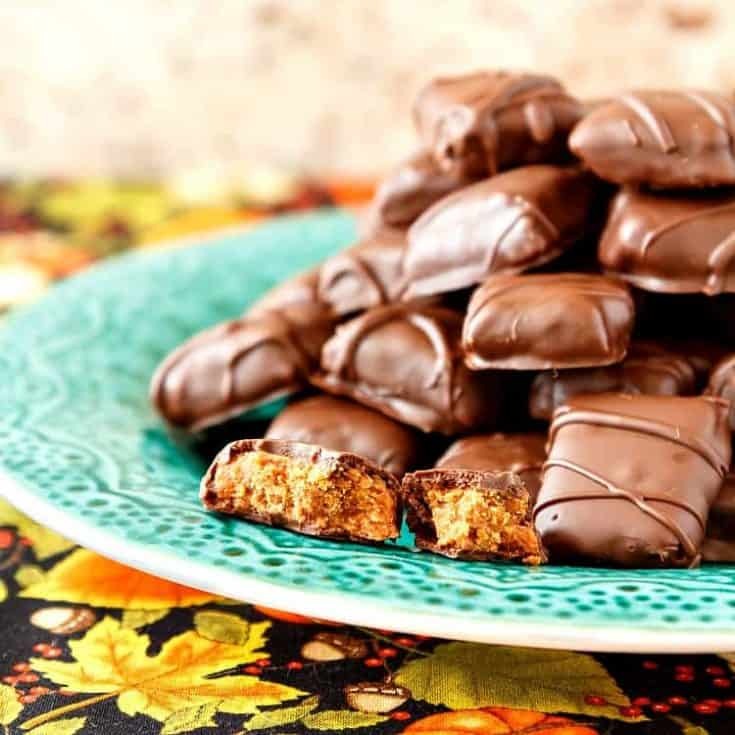 4.2 Are Homemade Butterfinger Candy Bars Hard to Make? 4.3 What Can Possibly Go Wrong? 4.4 Do I Have To Temper Chocolate To Make This Butterfinger Recipe? 4.5 What Can My Husband Do to Help? I am Extremely Excited, stoked even (and I never use that word), to bring you this crispy Butterfinger recipe, you guys. This is my most tested recipe ever. I submit I have developed a homemade copycat for Butterfinger candy bars that is as close to the factory-produced kind as I can get while using my regular kitchen equipment. That’s the number of times it took me to get these Butterfingers just right. I made some with a sugar syrup. I made others with melted down candy corn. Some I added molasses to. I tried different proportions of peanut butter to syrup. I tried folding the candy around the peanut butter (never try that. You’re welcome). And finally, after 8 tries and a two week break, I have it. Potion #9 is it. While I would never go so far as to say my Butterfinger recipe is healthy, I will say that my version tastes better than the originals, mainly because of the chocolate I used. More on that later. Note that Butterfinger has recently reformulated their candy bar recipe. The new recipe has only been available since February of 2019. I haven’t tried it yet, but when I do, I shall report back. I have made these candy bars/candy bites with candy corn, because candy corn already has the optimal proportion of corn syrup to sugar in them. However, candy corn is not vegan or even vegetarian due to the addition of some gelatin and honey. If that is a concern for you, I will also tell you how you can make these using corn syrup and granulated sugar. They will not be as orange-y as a real Butterfinger or as a Butterfinger recipe made with candy corn, but they will be vegetarian. And they will be delicious. Ingredients you’ll need to make this Butterfinger recipe. Remember, if you’re using candy corn, they won’t be vegan or vegetarian. See the recipe for a no-candy corn variation. Are Butterfinger Bars Gluten Free? Be cautious if you have a gluten allergy or are Celiac. These copycat crispy Butterfinger bars are gluten free as long as you are careful with your ingredient sourcing. Here’s a rundown of what you’ll need to make them, with the exception of one sneaky ingredient you’ll get in the recipe. 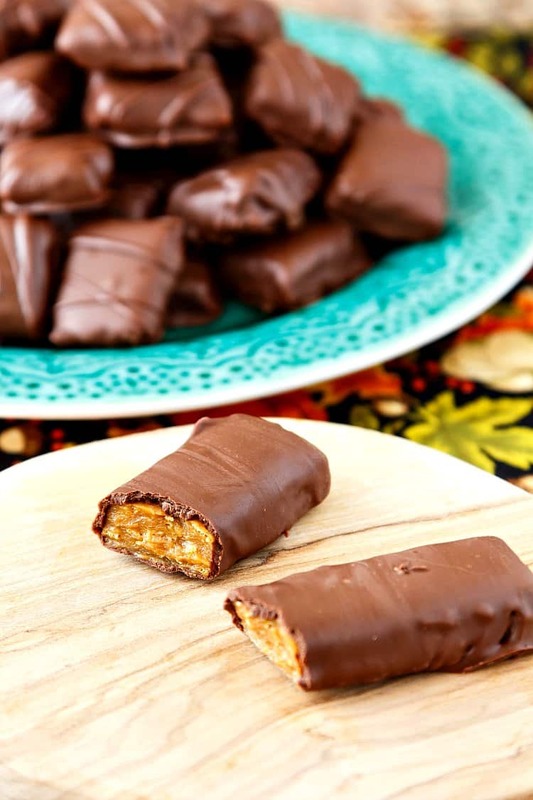 Are Homemade Butterfinger Candy Bars Hard to Make? I would definitely categorize this recipe as intermediate to advanced. It’s not hard to make, per se, but you are working with molten sugar, and you have to be careful. This is not a recipe to make with your kids unless they are older. Like maybe teenagers. Let younger kids help you dip the candies in chocolate, but keep them out of the kitchen or at least at a respectful distance while you’re making the centers. And definitely keep pets out of the kitchen while working with boiling sugar. Much better safe than sorry. PRO TIP 1: When working with molten sugar, keep a bowl of very cold water handy so you can immerse your finger or hand if a little bit of sugar splashes on you. Whatever you do, don’t stick your finger in your mouth. You’ll just end up with a burned finger and a burned mouth. PRO TIP 1: unless you’re making a ton of specialty chocolates, using a regular fork for dipping will work just fine. No need to get fancy chocolate dipping forks unless you really want them. For one, you can burn yourself. We’re cooking the candy corn mixture to just over 300F, and then we have to stir in some really thick peanut butter so be careful. Once I stir in the peanut butter, I scrape the molten candy out onto a Silpat and then knead it through the Silpat by folding it over. But, I have a fairly high tolerance for heat. If you don’t, consider using an oven mitt or even better, get an Ove-Glove to help you in kneading through the Silpat. You could also cook the candy too hot so it caramelizes, which is not what we want. Or you might not get it hot enough so that when it cools, your candy won’t be crispety crunchety. The following are affiliate links. Pastry Chef Online participates in the Amazon Associates program. If you make a purchase through one of my affiliate links, I will receive a small commission. Your price is not affected. 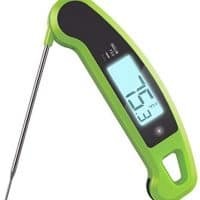 The only help for that is to have an accurate instant read thermometer or candy thermometer so you can monitor the temperature and know just when to add the peanut butter to the pot. Please note that a candy thermometer clipped to the side of the pot might not take a true temperature as the candy is generally cooler at the sides. Also, it might not read accurately unless the molten candy is deep enough. 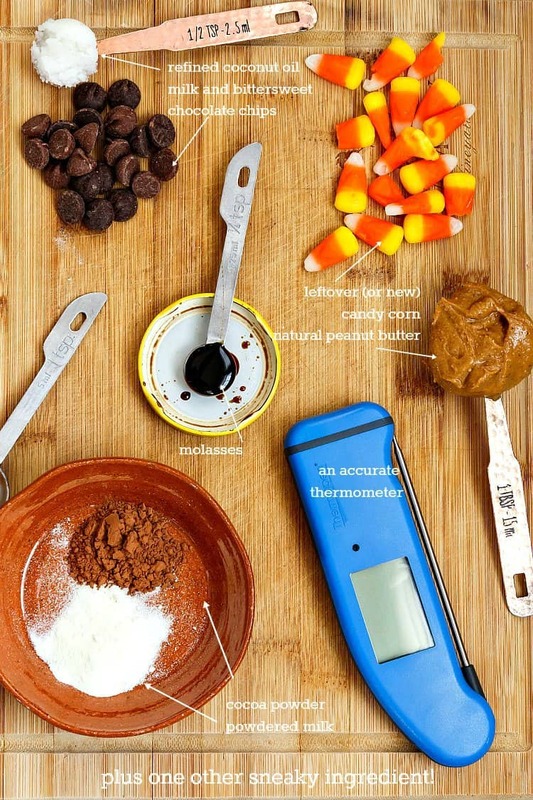 For this candy, you’re only looking at 8 oz of candy, so either double it or plan on tipping the pan to get a good reading with a clip-on thermometer. Do I Have To Temper Chocolate To Make This Butterfinger Recipe? No. I mean, you could use couverture and temper it, but since tempering can be finicky and I don’t know what the conditions are in your particular kitchen, I wrote this recipe to use homemade coating chocolate. It still sets up shiny like tempered chocolate, but it requires no special skill except for the ability to wait for the chocolate to set completely. And that can take a couple of hours if not more. The secret? Refined coconut oil. The formula is this: use 10% of the weight of the chocolate in oil. So for 10 oz of chocolate, you’ll need one ounce of oil. I will say it again. If you don’t have a kitchen scale yet, please get one. I promise it will make your life much easier. You will be so happy. What Can My Husband Do to Help? He can’t. Tell him to kindly leave you alone while you’re working. Whether you plan on making these into bars or (mostly) bites like I did, if you’re giving them as gifts, I guess he could put together the candy boxes. Honestly, I wanted The Beloved far from the action, because once the centers cooled off enough, I wanted to eat a few. You know, for quality assurance. If you’re feeling share-y, let him try a center or two. But if Butterfingers are your favorite and you don’t want to share, I will not hold it against you. Time is approximate and doesn’t count cooling and dipping time. Here’s the rundown of how to make this Butterfinger recipe so you can get the steps clear. Spread out your corn flakes in the center of a Silpat-lined half sheet pan. Put the pan close to the stove. Stir together the peanut butter, milk powder, and cocoa powder. Place that bowl convenient to the stove as well. Add candy corn and water to you pan. Heat over medium heat until the candy corn has melted. Then you can raise the temperature and cook the candy until it reaches 290F. Add the molasses and continue cooking until the candy reaches 305F. Once your candy reaches 305F, immediately remove from the heat and stir in the peanut butter mixture. Be careful and use a long-handled wooden spoon to minimize your chances of burning yourself. Pour candy out onto prepared Silpat. Scrape the candy out onto the corn flake-lined Silpat. Use the Silpat to fold the candy over to incorporate the corn flakes. Roll and fold the candy. As the candy cools and becomes more solid, you will be able to fold the candy over on itself into thirds, like folding a letter. 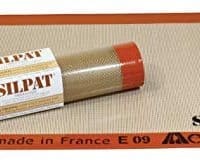 Do this a couple of times using the Silpat to help you so you don’t burn yourself. As the candy continues to cool, you’ll be able to roll it out and fold it without the Silpat (although it will still be very hot, so be careful). Score, Cool, and Dip. Done! Give the candy a final roll to about 1/3″. Use a pizza wheel to score the candy about halfway through. You can make whatever shapes you like. I’m a fan of tiny squares rather than large bars, but make them how you want them. 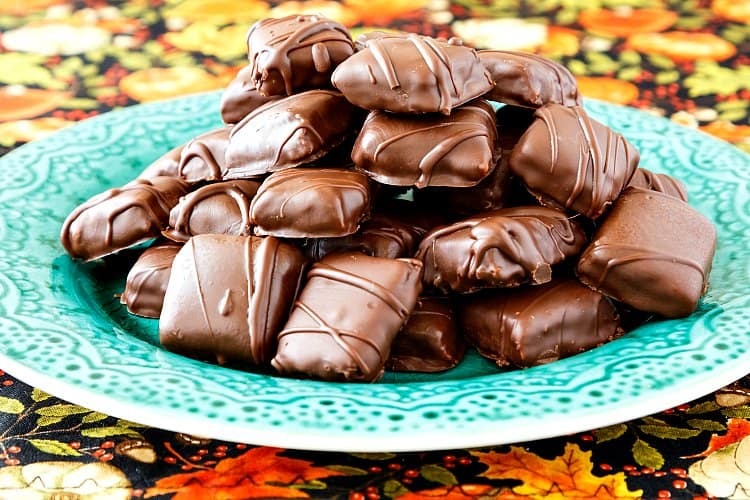 Once cool, break the candies apart and then dip them in the chocolate coating and let harden. Looking for more candy? Try this bourbon honeycomb candy. Or maybe this cashew toffee is more your style. And do not miss my butterscotch hard candies. Seriously. Don’t deny yourself. Make some candy. It’s rewarding and delicious! I hope you enjoy these, you guys. And remember, if something goes awry and your candy gets crumbly (this happened to me AT LEAST TWICE while testing), stir the crumbles into ice cream. Seriously, they’ll still be delicious! If you are a fan of Butterfinger candy bars but you wish the chocolate were tastier, or you just want to use up leftover candy corn, or you just love crunchy peanut butter candy, you are going to love these. NOTE: All measurements other than teaspoons and tablespoons are by weight. ANOTHER NOTE: If you do not want to use candy corn to make these copycat crunchy Butterfingers, I give you an alternate in the notes at the end of the recipe. Spread the corn flakes out in the center of a half-sheet-sized Silpat. Set aside convenient to the stove. MIx together the peanut butter, cocoa powder, and milk powder in a small bowl. Set aside convenient to the stove. Put the candy corn and water in a medium saucepan. Melt over medium-low heat, smashing the candies down with the side of a heat resistant spatula until the mixture is smooth. Increase heat to medium/medium-high and bring to a boil. Cook until the mixture reaches 290F. Add the molasses and swirl the pan to distribute it. Continue to cook until the candy reaches 305F. Immediately remove from the heat and scoop the peanut butter mixture into the candy. Be careful, and stir it together as completely as you can. Scrape the candy onto the corn flaked Silpat. Using the Silpat (and possibly an Ove Glove) fold the candy together with the corn flakes so it is somewhat layered. Fold the candy over, then press it out (again, with the Silpat folded over it), then use the Silpat to fold that. The candy will firm up in a couple of minutes at which point you can use a rolling pin directly on the candy to roll it out to about 1/4" and then fold it in thirds, like you're making puff pastry. Continue rolling and folding until the candy is stiff but not hard. Err on the side of too soft rather than too hard, or you won't be able to score it. Roll the candy one last time to 1/3" or so. Use a metal pizza cutter or a bench knife to score the candy about halfway to three quarters of the way through. You can choose to make them into small squares or into traditional bar shapes. It's your call. Allow candy to cool completely. Break along score marks. In a microwave-safe bowl, melt the two kinds of chocolate chips and the coconut oil on medium power in 30 second bursts. Stir in between. When chocolate is mostly melted, stir until it is completely melted. 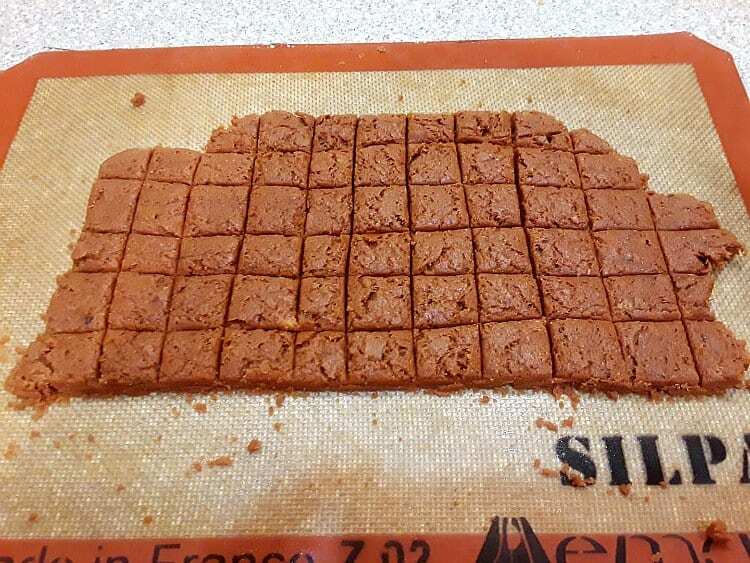 Line a half sheet pan or two with Silpat. Keep them close. Brush off any errant candy crumbs from your centers. Put 5-6 into the melted but not super hot chocolate. Using a candy fork or just a regular fork, turn them to coat. Pick one up on the tines of the fork and tap it against the rim of the bowl to even out the chocolate and let the excess drip off. Make sure the candy is right-side up. You can tell because the bottoms are completely flat and the tops have a slight curve from the scoring. Place each dipped and drained center on Silpat to cool completely. This could take a couple of hours. You can stop with one dip, but I like chocolate, so I double dipped mine. Reheat the chocolate and dip and drain all the candies a second time. Allow to cool. I drizzled some additional melted chocolate over the tops of the candies. This is completely optional, but it looks cool. Store, uncovered, in a dry place to cool/set for a few hours or overnight. I put my tray in the microwave. The oven (as long as it's off and you don't forget they're there) is a great place to put them as well, especially if you have animals or kids who might try to sneak them. As long as you know where they are and you can sneak them, it's all good. Package however you'd like, in cello bags or small candy boxes, or just put them on a plate. Share, or don't. I'm not judging. These crunchy Butterfinger candy bars will stay crunchy for at least a week or two, depending on humidity. They will be gone well before they lose their crunchiness, though. Trust me. If you prefer not to use candy corn as the base of these crunchy Butterfinger candy bars, you can use corn syrup, sugar and water. Stir together well, put the lid on your pan and bring to a boil. 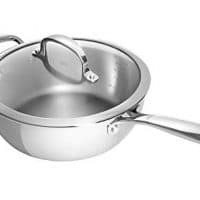 Allow this mixture to boil for a minute or two to wash down any sugar crystals off the sides of the pan, and then continue with the recipe as written. The candy will not have that distinctive orange color, but it will taste almost exactly the same. And it will be vegetarian. To make these candies vegan, make sure to use all vegan chocolate for coating. Nutrition Information based on 60 pieces of candy. If you make full-size bars, you'll get around 12-15 bars, so multiply the nutritionals by 4 or 5. And that’s it, you guys. Maybe not quite as crispy as the originals, but just as crunchy. Homemade Butterfinger candy, y’all. Nine times is the charm. Thanks for spending some time with me today, friends. 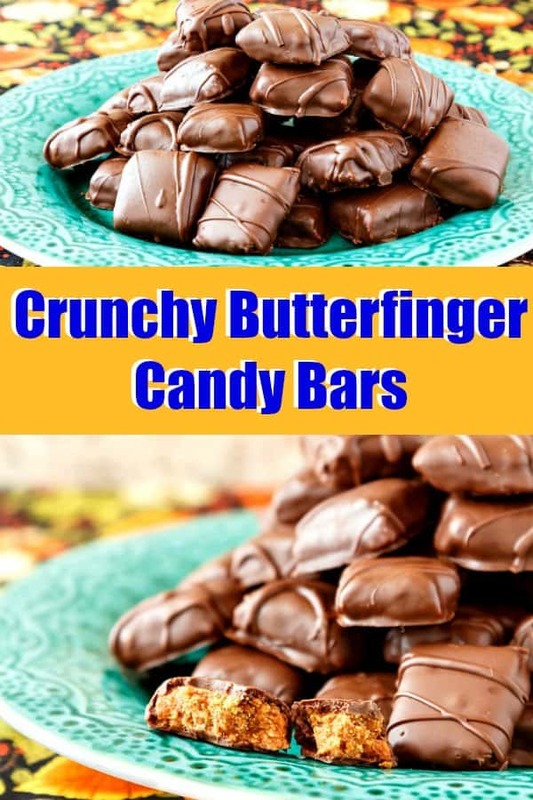 Enjoy the copycat crunchy Butterfinger candy bars! Holy cow you figured out the million dollar recipe! It’s like cracking the DaVinci Code! Can’t wait to taste the beauties! Haha!! Thank you! All the tests were tasty, but I really do think I got it right on try #9! What can my husband do to help? LOL – you are a wise woman!